EDIT: Giveaway is officially over. Congratulations to Angela A. Lilly for submitting the randomly-chosen 640th entry. You may want to get your hands on a turkey wishbone early this year and use it to wish for free jewelry. One reader's wish is bound to come true - Alison Storry Jewelry is giving away a $50 gift card to her Etsy shop to thank her fans. 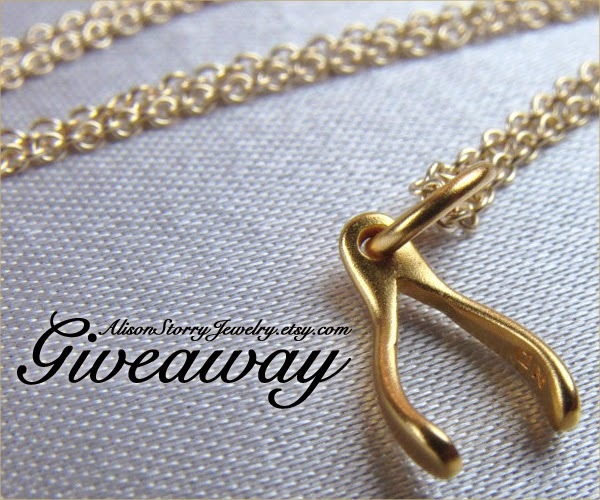 The winner could even choose the 24k gold over silver wishbone necklace above as a luck charm when entering other giveaways. Alison has been designing gold jewelry for 17 years. She started out with an 18k gold collection which sold in Saks 5th Avenue and other upscale boutiques. Now any woman in the world can gobble up beautiful bohemian jewelry in her more affordable online store. Use the Rafflecopter below to enter to win worldwide giveaway before 11:59pm EST on November 25, 2014. Be sure to leave the mandatory comment on the blog post with the same name you use to fill out the Rafflecopter - all entries by winner must be easily verified or a new winner will be chosen. Not including usernames when asked will also get you disqualified. DRUZY STACK BRACELETS - pearl bracelets - set of ten boho bracelets - coin charm bracelets - stretch bracelets - bohemian beach jewelry is my favorite. Does 50$ gift card mean the winner has to purchase more that 50$ in order to use the gift card? Thanks. Alison allows the winner to pick an item under $50 by emailing her the listing link. If winner wants something over $50, then she will send an invoice for the difference. Really difficult to choose because i adored everything! I would say https://img1.etsystatic.com/037/1/6694200/il_570xN.578328673_lx6s.jpg although i adored https://img1.etsystatic.com/049/0/6694200/il_570xN.668435017_nek7.jpg also!! Hi! I have lots of favourite items, but one of myfavourite necklaces is the GEOMETRICAL SODALITE NECKLACE / bohemian jewelry / blue sodalite necklace. My favorite item is the DRUZY NECKLACE / rainbow moonstone charm necklace / wood branch charm necklace / ball chain. I really love this shop! I love the Druzy necklaces! It's really hard to pick just one, they're so pretty. All the Druzy necklaces are gorgeous! I like the "DRUZY NECKLACE / rainbow moonstone charm necklace / wood branch charm necklace / ball chain!" Oops sorry, my StumbleUpon name is k8053. I love the Blue Topaz Necklace. SET OF THREE stack bracelets is my favorite. I really like the Silver angel wing charm necklace. It is so beautiful! I like the pyrite stack necklace! so cute! Love the Gold Circle Necklace! Thank you for the giveaway! Your jewelry collection is antique and gorgeous. I love the topaz necklace as shown in pic#1. Its falling pattern is very sophisticated and eye-catching. It is an exact contrast with my sky-blue dress. Fingers crossed, hope I win this. The Calla Lillyearrings are pretty! My favorite is the silver branch necklace. So pretty! The Bezel set Blue Agate Gemstone Necklace is my favorite! I like the Blue Agate Gemstone Necklace! I LOVE the orchid necklace! I really like the Mint Green Prehnite and Faceted Garnet Gemstone Necklace-14k Gold Filled-UNIQUE. It has all my colors. My ETSY name is Margaret Ward, my email is barniebad but most of my entries are under Marnie Ward (My nickname). I love the simplicity of the gold teardrop necklace. I like the Silver Branch Necklace. I am signed into the rafflecopter form as Angela A. Lilly via my FB account with the same name. I am in love with the bubble necklace! I love all the druzy and geode jewelry. I like the DRUZY EARRINGS - orchid flower earrings. I love the druzy necklaces! I love the SET OF FIVE labradorite stretch bracelets / tahitian pearl bracelet / hammered gold circle bracelet. I like the AGATE SLICE NECKLACE. I have a lot of faves, but I have been wanting something like the druzy with the blackened chain for a while. So many beautiful pieces, I really like the Gold Bezel Set Labradorite Gemstone Necklace. I like the Tahitian pearl bracelet. I really like this necklace, Moon and Star Sterling Silver Charm Necklace - Charm Necklace. Thank you!! I love the Bezel Set Druzy necklace! So beautiful!! I think the AQUA JADE NECKLACE is so pretty. These earrings are amazing, though it was hard to choose...everything is cute and classy! I really like the Moon and Star Charm Necklace. The moon charm piece is so simple and beautiful. Alison really does have beautiful items! I LOVE ALL of her Druzy jewelry- I can't even pick my favoritest!! Thanks for the chance, Kristin! I love the Druzy necklaces! Gorgeous. My favorite is Rainbow Moonstone Necklace / Tourmaline Necklace / Pendant necklace / Bohemian Jewelry / Bezel Set necklace. My favorite item is the SET OF THREE stack bracelets - bezel set bracelet - chrysoprase bracelets - gold bracelets - boho stack bracelets - stretch bracelets. LOVE these! I like the LONG TURQUOISE NECKLACE long bezel set turquoise ruby charm necklace! I love lots of the jewelry, especially the turquoise necklace. My favourite are the DRUZY EARRINGS / peacock blue earrings / agate earrings / gold earrings. I really like the Double Heart Monogrammed Necklace. I love the Sterling Double Angel Wing Necklace. I like the sTACK BRACELETS / set of three bracelets / moon charm hematite bracelets / star charm bracelet / evil eye charm blue agate bracelet! I love the druzy necklace bezel set necklace. It looks very nice. My favorite is the Double Heart Monogrammed Necklace / Silver Hammered Heart Charm Necklace / Valentine Jewelry! My favorite is the Rainbow Moonstone Necklace. I like the Silver Tree of Life Charm Necklace. I like the silver angel wing charm necklace. I love the Sapphire Bracelet / pearl charm bracelet / bridal jewelry. I like the Bezel Set Druzy necklace.